The items in this review were provided by a marketing representative. For the past week or so, I've been reviewing snacks from Skoshbox, a new subscription box service just for Japanese candy, snacks, and trinkets. Let me repeat that I received a promotional box, but I'm not affiliated with Skoshbox and did not (nor will I) receive any compensation for the reviews or for anyone who subscribes. I just think it's a great idea and I want to help spread the word! You can find my previous reviews here and here. Skoshbox is $12 a month including shipping, and you can find more information at their website. If you do decide to sign up, you can use the code SNACKLUV04 by July 15th to receive a free mystery snack with your first box! Currently, Skoshbox only ships within the US. 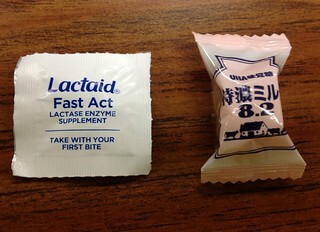 UHA High Concentration Milk Candy was a little scary because of my lactose intolerance, but it was nothing a little Lactaid couldn't fix. The hard candy was extremely milky, as expected. It tasted a lot like drinking heavy cream, and it was pleasant and rich. The candy itself melted down slowly and uniformly, leaving no jagged edges as it got smaller. The Marukawa Orange Fusen Gum came in a set of 4 gumballs in a small box. I split it with my husband, so we both chewed 2 pieces at once. The gum was very soft and smooth, making it a little tricky to blow bubbles. The flavor authentic orange with a little extra sweetness, sort of like a creamsicle. We both loved the gum, and the flavor longevity was about average (less than 5 minutes). The Shoyu Bite-Sized Senbei had an extremely mild soy sauce flavor that was so subtle, it got a bit lost in the salty and buttery flavors of the crackers. They had a great crunch, but the flavor was a little bland. These would be an excellent introduction to senbei, because some varieties have much more intense flavors. Since matcha (powdered green tea) is my favorite flavor in the world, the item that had me the most excited was the LOOK Matcha Mousse. 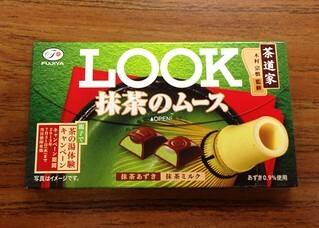 It contained two flavors: Matcha Azuki (red bean) Matcha Milk. Unfortunately, the chocolate lost a little something in shipment, and it was a bit dry. 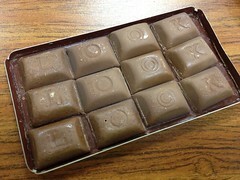 The dry chocolate lost its smooth texture and a bit of its cocoa flavor, but the insides were still intact. The mousse in the Matcha Azuki had a mild flavor, and the sweet red bean gel was sweet and almost jammy. The Matcha Milk mousse was a little creamier and stickier, and the matcha flavor was stronger. I liked both, but liked the Matcha Milk just a bit better. In cooler months, the chocolate would be just fine, but it wasn't up to the journey this time of year. 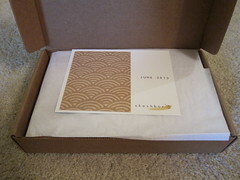 Despite a few issues with chocolate texture, I loved my June Skoshbox, and I'm definitely going to subscribe. For the overall experience, I give Skoshbox an A-. The only change I could recommend would be fewer chocolate items in warmer months. 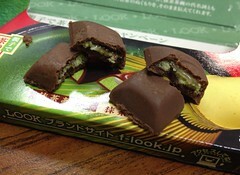 Still, Skoshbox is a great way to try new Japanese snacks, or to enjoy your old favorites! The June box had a great variety of items, and I am looking forward to seeing what comes next month! One of the nice things about receiving the Skoshbox is that it's given me the chance to try Japanese snacks I've seen but never tried before. If I'm shopping at a store or online, I'll go for the KitKats and Tirol chocolates every time, so it's fun to try things that someone else has picked! As discussed in my previous post, Skoshbox is a new subscription box for Japanese candy, snacks, and trinkets. I received a promotional box and have been covering the items within, but I'm not affiliated with Skoshbox and did not (nor will I) receive any compensation for the reviews or for anyone who subscribes. Skoshbox $12 a month including shipping, and if you do decide to sign up, you can use the code SNACKLUV04 by July 15th to receive a free mystery snack with your first box! Currently, Skoshbox only ships within the US. Umaibo is the perfect example of something I've seen in stores many times but never got around to trying. It's a cylindrical puffed corn snack that comes in tons of different flavors, and the mascot looks awfully similar to a certain ear-less cat... The promotional box included Mentai and Cheese flavors. I tried the Mentai first because it sounded more interesting. Mentaiko is marinated fish roe, and the stick did smell just a tad fishy (in a good way). I don't remember ever eating mentaiko, but the Umaibo certainly tasted like Japanese food. It had the flavors of soy sauce, fish, and onion, with a hint of pepper heat. The coating was quite salty, but still tasty. 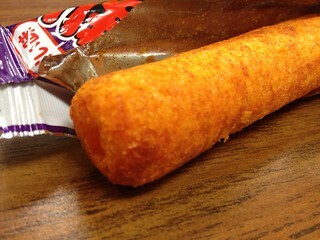 It was very similar to Cheetos in terms of crunch. I will probably let my husband have the cheese flavor, but I'm curious to see how closely it resembles American cheese puffs. 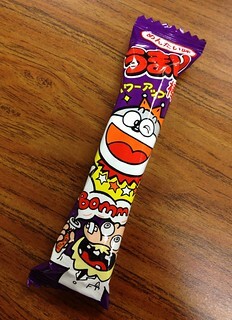 The Skoshbox also included 2 individually wrapped Morinaga Hi-Chew candies in grape and apple. Hi-Chew does a great job with authentic, juicy fruit flavors, and these were no exception. The product guide included in the box explains that Hi-Chew was designed to be an edible chewing gum, which explains the bouncy, almost rubbery texture and long-lasting chew. Hi-Chew is slowly becoming available in stores in the US, but it's still mostly confined to the East and West coasts. 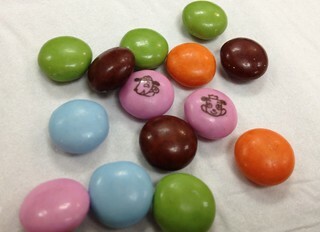 One of the long-standing candy rivalries (at least in my head) is between M&Ms and Smarties. Preference seems to depend upon home country, and being partial to M&Ms, I'm no exception. 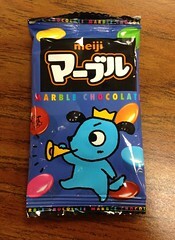 Meiji Marble is a similar type of candy, but I'm not sure it's quite in the same league. The texture of the Marble pieces reminded me of Reese's Pieces - thin, crispy shell, and smooth, almost airy chocolate inside. The chocolate wasn't very rich or solid, but it did have a nice, mild cocoa flavor. I loved that a couple pieces had character faces, and it was fun to see a different variety of colors from other similar candies. 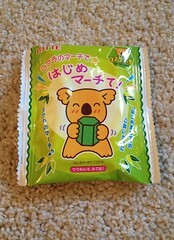 Lotte Koala's March is a classic Japanese snack that was available in the US as Koala Yummies when I was a kid in the 1980s. It's a simple chocolate cream filled cookie, and it tastes the same as ever (which is to say it's pretty yummy). The filling is sweet, but the crunchy cookie shell isn't, so it's got a good balance. The only issue I have with Koala's March is that it contains some trans fat, so I keep my consumption to infrequent, small servings like this. Since I'm probably not going back to Japan in the near future, I'm very tempted to subscribe to Skoshbox for July. I'll finish up the rest of the snacks within the next couple days and keep you posted on my decision! Is anyone else thinking about signing up? 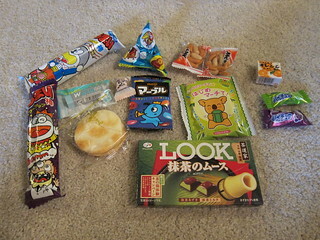 The most common question I get about this blog is, "Where do you buy Japanese snacks?" In the United States, unless you live in very specific areas, Japanese import shops are few and far between. 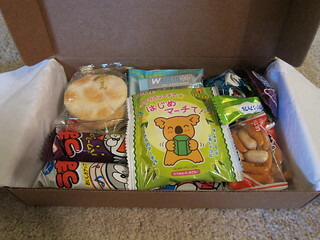 When I was contacted by a marketing representative for Skoshbox, a new subscription box just for Japanese snacks and goodies, I agreed that it was a perfect fit for Snack Love readers. Skoshbox was created by two childhood friends who have lived in both Japan and the United States. The creators hand-pick each item, ranging from Japanese candies to traditional snacks to stationery. Skoshbox kindly offered to send me their June box, and I'll be reviewing the snacks over the coming days. Please note that while I did receive the promotional box, I did not receive any compensation for writing about Skoshbox here, nor will I receive any compensation should you choose to subscribe. I'm writing just because I honestly think it's a fun service! The service is $12 a month (including shipping), and a 6 month gift subscription option is available. If you think you might be interested, check out Skoshbox.com for ordering information. In addition, Skoshbox has kindly created a promotional code for Snack Love readers! Use the code SNACKLUV04 at check out to receive a free mystery snack with your first box. This code expires on July 15th, which is also the last day to sign up for the first box. 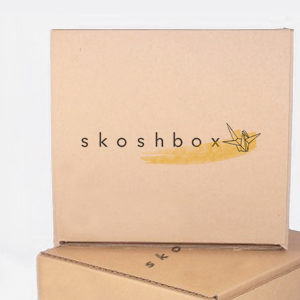 At this time, Skoshbox only ships within the United States. Here's a rundown of the items in the June box: Choco Ball, Orange Bubble Gum, Kaki no Tane, Marble Chocolate, Koala's March, Milk Hard Candy, Hi-Chew, Look Chocolate, Shoyu Senbei, and an Air In Eraser. This is a pretty classic assortment of Japanese snacks and candies, which would be especially great for someone new to the world of Japanese goodies, or someone feeling nostalgic for old favorites. The snacks covered the spectrum from savory (Kaki no Tane and Senbei) to sweet, chewy to crunchy to hard candy, and the eraser was a nice touch! A postcard listing everything in the box was included, and I loved that there was a little fun fact about each item. To start with something savory, I tried the Kaki no Tane. 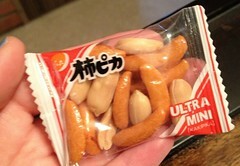 It's a mix of peanuts and tiny rice crackers shaped like persimmon (kaki) seeds. I never paid much attention to Kaki no Tane, although I did think that they were actual persimmon seeds (so now I feel a little silly). But clearly, I was wrong to ignore this snack. The rice crackers were mildly spicy with a light soy sauce flavor, and they had a nice crispy texture. The peanuts were simply lightly salted nuts. The mix of the two components was great, and they were so addictive! 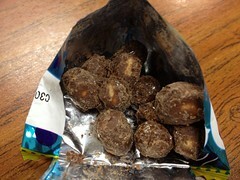 Choco Ball is a simple snack: chocolate covered nuts. 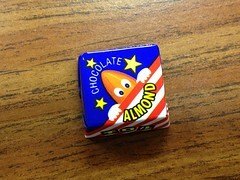 Although the card enclosed in the box said that these had an almond in the center, it was actually a peanut. The peanut was toasted, crunchy, and much lighter than the peanuts I'm used to, but I liked the texture! The bite-sized balls were just slightly sweet and highly addictive. Unfortunately, shipping chocolate in the summer months is always a bit of a gamble, and though the Choco Balls were still tasty, they were a little worse for the wear. 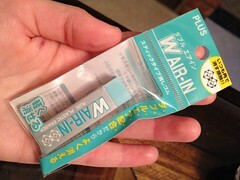 As for the Air-In eraser, I thought it was a fun extra. Japanese stationery has a well-deserved cult following in the USA. One swipe of this soft, gummy eraser and you'll see why. I can't even count all the Japanese pens, pencils, and erasers I've amassed over the years, and I'm still hungry for more. While I was a little disappointed that the Choco Ball had melted, I was still quite pleased with the variety of items in the box - many of which were much more heat-stable! Stay tuned for more items from the Skoshbox! If I'm feeling like a splurge, I often turn to chocolate. 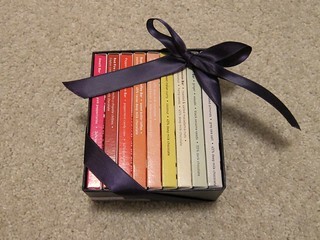 In this case, my splurge resulted in this Vosges mini bar sampler pack. I bought it on special the day after Thanksgiving last year, and it wasn't a bad deal! The pack came in a bundle of cookie mixes and other chocolates that I doled out as Christmas gifts, but I greedily kept the sampler for me. 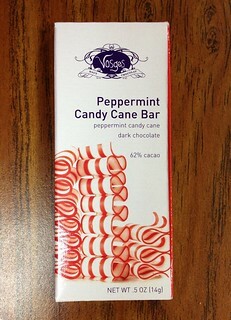 Vosges is known for some pretty wild flavors (carrot or Absinthe, anyone? ), but the flavors I'll cover in this review are fairly tame. 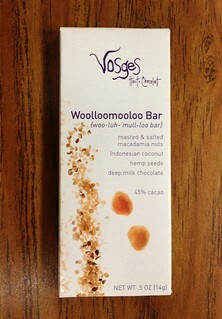 The Woolloomooloo is a slight variation on the winning combination of nuts + chocolate, and the Peppermint Candy Cane bar is perfect for Christmas (or maybe Christmas in July by the time I post this review). It's time to emerge from blogtirement! 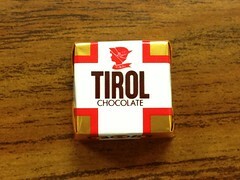 It's been a little while, but before it got too hot to ship chocolate to my house, I purchased this 9-pack of Tirol chocolates from napaJapan. 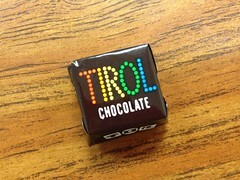 It's the standard assortment, though Tirol always rotates a few limited edition flavors in and out of these packs. If you bought this assortment now, you'd get Lemon Cookie instead of Caramel Bis. Some of these flavors have been reviewed here before, including Milk, Hot Cake, and White & Cookie Crunch. Some of the never-before reviewed on this blog flavors in this assortment are classic Tirol chocolates, so most of them should be easy to find online or in Japanese import grocers. 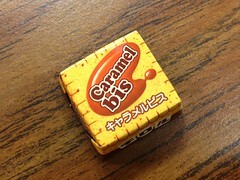 One of the rotating flavors in this mix was Caramel Bis, which is a twist on the classic Bis. 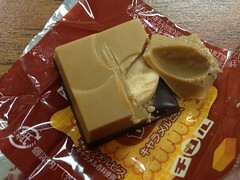 The dark chocolate and caramel chocolate layers reminded me of purin. 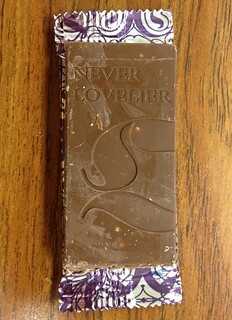 The lighter caramel chocolate was sweet and creamy, and it mixed well with the darker, slightly bitter chocolate base. The center biscuit added a fun crunch, but as usual, not much flavor. 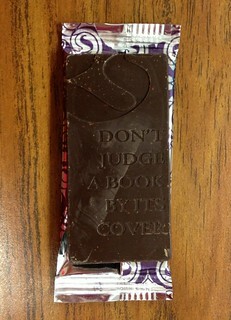 The darker chocolate was a nice touch and it made this flavor stand out. According to the Collection section of Tirol's website, Chocolate Almond has been through a few different wrappers before the cute one we see today was introduced in 1996. The tried and true combination of almond and chocolate is just what you'd expect. The chocolate smelled nice and nutty, and it a little sticky but melted smoothly. The almond had a crunchy caramelized coating and it imparted hints of cherry flavor. According to the Tirol website, the Milk Nougat flavor was introduced in 1983 and the Swiss-inspired packaging hasn't changed since then. 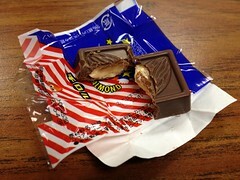 I tried to break this one in half for the second picture but the nougat was too hard! 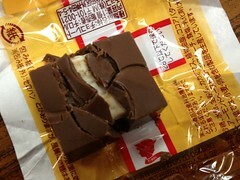 The piece only smelled of plain chocolate, but the nougat had a slightly nutty flavor. I liked the taste but wasn't crazy about the texture; the nougat was at first sticky like taffy, then crumbly, and finally it got stuck in my teeth. 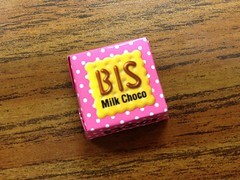 Regular Bis is one of Tirol's standard flavors, and it's also one of my favorites. It's a simple combination of sweet milk chocolate and a crunchy, cracker-like biscuit. 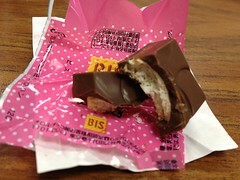 The biscuit was dry and pretty bland, but it added a nice crunch and balanced the sweetness of the milk chocolate. 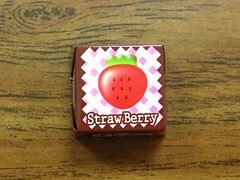 Strawberry was a simple pink strawberry filling covered in milk chocolate. The filling was creamy, fluffy, and full of strawberry seeds. 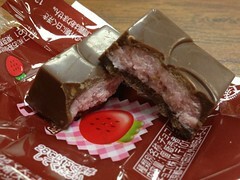 Despite a slightly soapy taste, the strawberry flavor wasn't bad. On the whole, it was quite sweet. Finally, the iconic Coffee Nougat flavor. I love the contrast of the colorful lettering against the dark wrapper, but I like the packaging better than the flavor. It smelled mostly of chocolate and just barely of coffee. 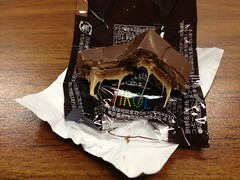 The nougat had a mild, lightly roasted coffee flavor, and it had the consistency of extremely thick, sticky caramel. This is another stick-to-your-teeth piece, and it's just not worth the potential tooth decay. Overall, this collection was a B. The Caramel Bis was my favorite of the bunch, but though they may be classics, I just wasn't crazy about either nougat flavor.